At first sight, the digital revolution poses an existential threat to established incumbents. But we believe they can thrive in the digital age – if they adapt. Just as the steam engine and electrification revolutionized entire sectors of the economy from the 18th century onwards, so the Internet, robotics, artificial intelligence and data analytics are beginning to dramatically alter today’s industries. The pace of technological change is accelerating. It’s been frequently observed that improvements in computing power have largely kept pace with Moore’s Law. The plummeting cost of advanced technologies (see infographic) means that the world around us is becoming ever more connected. In 2005, there were just 500 million devices connected to the Internet; today there are 8 billion. By 2030, it’s estimated that there will be 1 trillion. Empowered digital customers. E-commerce allows customers (both B2C and B2B) to access global markets and source products from around the world, increasing competition among retailers and manufacturers. Big-bang disruption. New technology, when adopted at pace and at scale can disrupt entire product lines, leading to shorter product life cycles. Winner-takes-all economics. As cost of distributing digital products and services to global markets is almost zero, winner-takes-all economics dominate the digital economy. Myth 1: Digital disruption is bankrupting incumbents. All is lost for incumbents and they fear there is no way back. Empowered customers, big-bang disruption and winner-takes-all economics may seem like a perfect storm for analog incumbents (which we define as large successful enterprises that predate the digital revolution). For incumbents, the cautionary tale of Kodak’s bankruptcy, brought on by its failure to react quickly to the disruptive impact of digital photography, is frequently cited. During 2015, around 70 startups achieved unicorn status, achieving valuations of $1 billion or more. The rise of the unicorns has implications for analog incumbents. Hundreds of startups are now attacking traditional markets, thanks to the democratization of technology, increased access to funds and a rising entrepreneurial culture. Reality: The game is not over for incumbents. They have significant resources such as hard assets, brands, global distribution, customer relationships, data and decades of institutional know-how to harness for their digital transformation. In a sense, they are too big to fail. The fact that Kodak’s story is cited so often is evidence that its fate is the exception rather than the rule. Digital disruption is not (yet) bankrupting Forbes Global 2,000 companies. Evidence: Although the top 100 startups have an impressive combined valuation of approximately $470 billion, this is exceeded by Google and Apple’s valuations individually, and dwarfed by the total valuation of the top 10 S&P 500 companies, which stands at $3.6 trillion. Incumbents have also attracted more employees over the past decades, with the average full-time employee count of S&P 500 companies increasing by 17% from 42,000 to 49,000 during this period. Myth 2: Digital is a back-office issue focused on achieving operational efficiencies. Reality: Companies that have implemented digital technologies across their business, have been successful in enhancing revenue sources, competing against digital natives and outperforming peers. 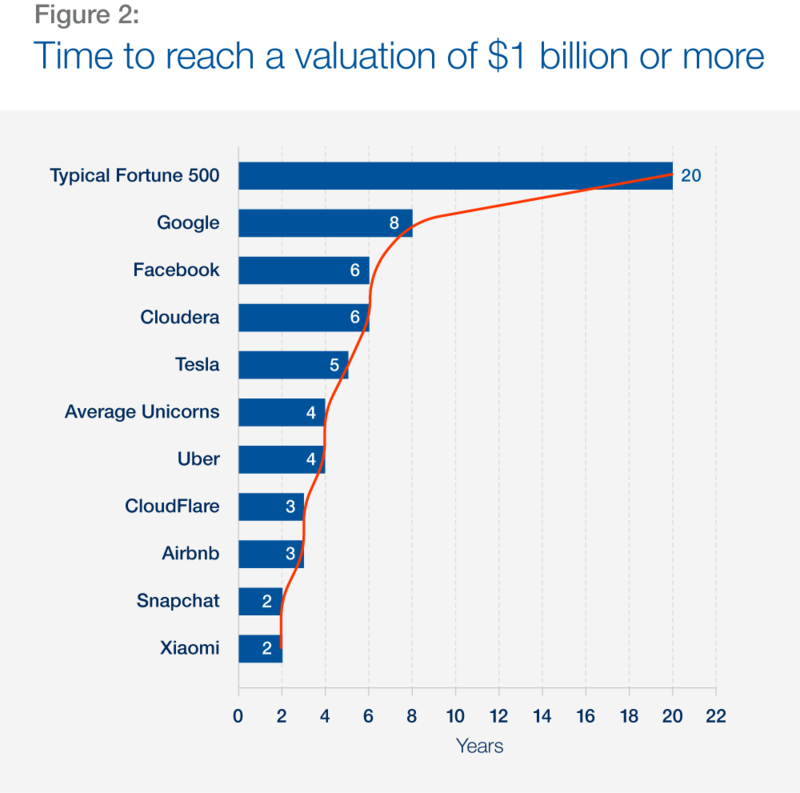 Evidence: It used to take Fortune 500 companies an average of 20 years to reach a billion-dollar valuation, but today’s startups are getting there much quicker: Google managed it in eight years, and the likes of Uber, Snapchat and Xiaomi in four years or less, partly through successfully harnessing digital technology. Myth 3: Companies can implement a successful digital transformation simply by launching a digital business unit and hiring a Chief Digital Officer. Reality: Successful digital transformation demands a culture sponsored by the leadership that promotes innovation, encourages risk taking and empowers employees at all levels of the company. Evidence: While launching a digital business unit has worked well for GE, it hasn’t been successful for all companies. Spanish telecommunications giant Telefónica made a similar move in 2011, but had another group reorganization in 2014 after revenues declined. Many boards do not have the generational diversity or digital literacy to successfully digitize. Digital transformation needs to be owned by the CEO, who must be accountable for its success. Busting these myths leads us to an important point: incumbents will need to transform themselves into digital enterprises to thrive, and this transformation will need to be far more profound than merely investing in the latest digital technologies. A truly digital enterprise stands for more than just using new technologies for the sake of it. Rather, what really distinguishes and gives a digital enterprise its competitive advantage is its culture, strategy and way of operating. Digital enterprises strive continuously to enable new and leaner operating models underpinned by agile business processes, connected platforms, analytics and collaboration capabilities that enhance the productivity of the firm. A digital enterprise relentlessly searches out, identifies and develops new digital business models, always ensuring that customers and employees are at the center of whatever it does. In the following articles, we examine how companies can identify and implement the changes that are needed to become a digital enterprise. We focus on business models, operating models, attracting and retaining talent, and measuring the success of digital businesses. 1. Companies with Better Digital Business Models Have Higher Financial Performance,” Center for Information Systems Research, MIT Sloan Management, Research Briefing Volume XIII, Number 7, July 2013. Digital enterprise is one of four cross-industry themes (along with digital consumption, societal implications, and platform governance) that have been the focus of the World Economic Forum’s Digital Transformation of Industries (DTI) 2016 project. An overview of the DTI program can be found here. Our in-depth analysis of the digital enterprise cross-industry theme is available in a white paper, which can be downloaded here.